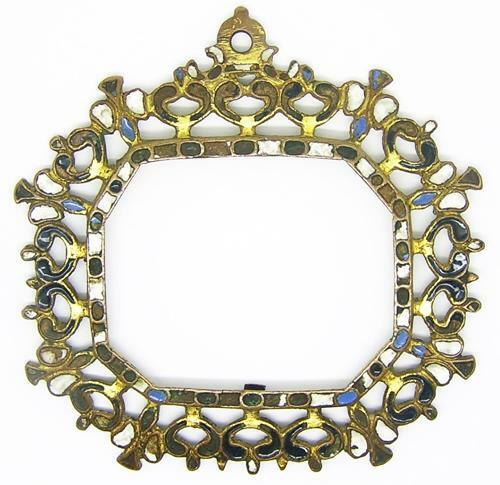 This is a handsome Tudor enameled frame, dating to the 16th - 17th century. The frame is of the type used to house early portrait miniatures of King Henry VIII (see the last photograph in the Fitzwilliam Museum- dated 1525 - 1527). This example uses the same blue, black and white enamel. It bears traces of the original mercurial gold gilding. One of the original four securing tabs is intact, so too the suspension loop. Such frames were also used to contain reliquaries and embroideries. A nice historic piece with a good patina.